As skin loses elasticity with age, the lines that run from the sides of your nose toward the corners of your mouth (nasolabial folds) and the lines that run from the corner of your mouth toward the chin (marionette lines) appear more noticeable. Restylane® made by Galderma, is a biodegradable gel used by dermatologists in injections targeted at smoothing out wrinkled skin. With over 30 million treatments worldwide and counting, Restylane® yields natural results by smoothing away facial wrinkles and folds, providing subtle lip enhancement and smoothing the lines around them and adding lift and volume to the cheeks. Restylane® is primarily composed of hyaluronic acid, a natural substance occurring within the body. This compound is also the only FDA approved dermal filler on the market for use in treating wrinkles. In addition, not only does the injected volume of Restylane® add fullness to skin, but it also attracts water molecules to the site of injection further enhancing its effectiveness. Galderma has recently announced the two most recent Restylane® fillers that are a part of the Galderma family; Restylane® Refyne and Restylane® Defyne. What makes Restylane® Refyne and Restylane® Defyne different from other fillers? Restylane® Refyne is specifically formulated hyaluronic acid dermal filler made with XpresHAn Technology™ that helps correct these lines for a more natural look to your face. The unique cross-linking of the gel in Restylane® Refyne is also designed to help support your natural expression for natural results that help maintain natural movement when you’re smiling, frowning and puckering. 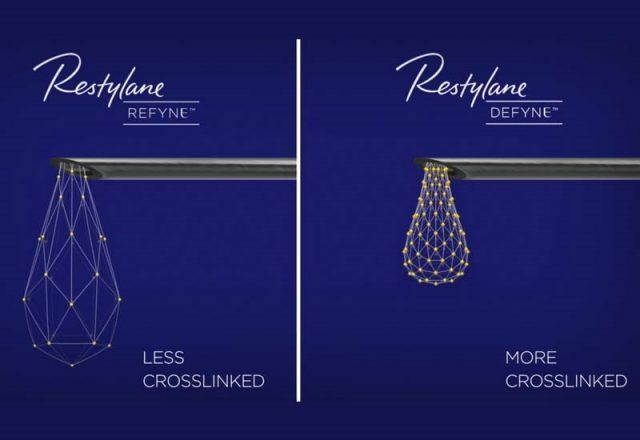 Restylane® Refyne was approved to treat moderate wrinkles and folds found on the nose and the mouth, while Restylane® Defyne is used to plump and fill in deep-set facial lines. Where can Restylane® Refyne and Restylane® Defyne be injected? Restylane® Refyne is used to treat moderate to severe “laugh lines” around the mouth. Defyne is used for deeper nasolabial folds, also known as “laugh lines.” Both products have a 12 month FDA indication. In a clinical study, subjects were evaluated based on perception of the naturalness of facial expressions in motion after 1 month of Restylane® Refyne and Restylane® Defyne optimal treatment. Because of varying densities or flexibilities, most filler can only be used in one or two specific areas of the body. This is one reason why there are so many fillers available on the market. From fillers for superficial lines to those that are meant to plump lips and provide facial volume, there are few types of filler out there that can be used across the board for multiple improvements. Due to the versatile nature of both dermal fillers, they can be used in more areas, eliminating the need for combining multiple fillers. In addition, both fillers offer soft support for multiple areas, such as laugh lines, nasolabial folds, and marionette lines. Why Choose Ritacca Cosmetic Surgery and Medspa for Restylane® Refyne and Restylane® Defyne in the Greater Chicago Area? Ritacca Cosmetic Surgery and Medspa is a top cosmetic treatment practice in the state of Illinois. With certified Galderma trainers as providers in our practice, our treatment facility is often the first in the state, and one of the first in the nation, to offer new procedures to patients in the Greater Chicago area. Our facility is state-of-the-art, offering the most advanced technologies with proven results. Unlike many medical spas, our practice has four physicians on staff who consult with patients on a daily basis while supervising our highly trained and skilled nurses and aestheticians. This ensures both excellent results and safety for the patients under our care. Schedule a consultation with one of our skilled injectors.